"Top Chef" alum Fabio Viviani has opened Siena Tavern in River North, serving rustic Italian eats, like coccoli (fried dough with stracchino cheese and prosciutto) and pasta that's made in house. Cocktails come from Femme du Coupe's Revae Schneider, and there's a house draft from Jared Rouben (ex-Goose Island Brewery). Siena Tavern, 51 W. Kinzie St., Chicago, IL 60654, 312-788-7078. Chicago Chop Shop will serve rustic food, prepared by Epic and Urban Union vet Joshua Marrelli, in a setting that's equal parts restaurant, performance space and butcher shop. Chicago Chop Shop, 2033 W. North Ave., Chicago, IL 60647, no phone. Brendan Sodikoff (Gilt Bar, Maude's Liquor Bar, Au Cheval, Bavette's Bar & Boeuf) has opened Dillman's, a Jewish deli. He also plans to revamp the old Maxim's Gold Coast space, creating a more timely menu in its wake. Look for that one in early 2014 at 24 E. Goethe, Chicago. Dillman’s, 354 W. Hubbard St., Chicago, IL 60654, 312-988-0078. OON, the long-awaited project from Matt Eversman, Jon McDaniel and Sean Currie, has opened in the West Loop, ushering in a new option for Southeast Asian and contemporary American cuisines. Dinner Mon.-Sat. OON, 802 W. Randolph St., Chicago, IL 60607, 312-929-2555. Benjamin Schiller's The Berkshire Room is open for business in the ACME Hotel Company, serving boozed-up barrel cocktails, and spirits poured from old medicine bottles, plus a line-up of posh bar food from exec chef Chris Curren and pastry chef Chris Teixeira. The Berkshire Room, ACME Hotel Company, 15 E. Ohio St., Chicago, IL 60611, 312-894-0800. Eleven City Diner opened offshoot Eleven Lincoln Park, with its own in-house soda jerk and full-fledged delicatessen. Eleven Lincoln Park, 2301 N. Clark St., Chicago, IL 60614, 773-244-1112. Michael Sheerin has moved on from his partnership with his brother Patrick at Trenchermen. Word is he'll resurface somewhere in the Gold Coast early this fall. 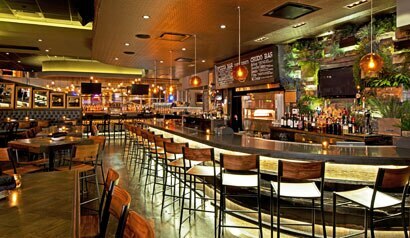 Trenchermen, 2039 W. North Ave., Chicago, IL 60647, 773-661-1540. Dimitri Fayard is the new pastry chef at The Peninsula Chicago, and he's well into switching up the menu, as evidenced by options like chocolate hazelnut crumble with chocolate sponge cake, chocolate ice cream and --- who would've thunk --- lemon gelée. The Peninsula Chicago, 108 E. Superior St., Chicago, IL 60611, 312-337-2888. Jellyfish has a new chef: Jason Im, who worked at Bar Charlie in Las Vegas as well as the defunct A Mano. The pan-Asian spot now serves the likes of buttermilk-marinated, battered Buffalo frogs' legs and Brunkow cheese curds with bacon and kimchi. Jellyfish, 1009 N. Rush St., Chicago, IL 60611, 312-660-3111.